You know what a flash mob is, right? Wikipedia calls it “a large public gathering at which people perform an unusual or seemingly random act and then disperse, typically organized by means of the Internet or social media.” Is there a space for flash mobs in organizational life? On the surface, it would seem not so much. But what if you combine elements of the flash mob concept with something else like the hackathon, with its incredibly focused brainstorming to quickly solve complex challenges or problems? Combine the concepts of flash mob and hackathon and what you get for organizations is the flash team. But let me back up for a minute. Why would you want to combine those things to begin with? If you’ve ever seen or been part of a flash mob, you know how impactful they can be. There is an element of surprise and high energy that is contagious – they make people happy. The hackathon, on the other hand, has the added benefit of putting that high level of energy to work in solving problems or meeting a challenge. Firms that have taken the hackathon concept really big have open or crowd-sourced innovation programs such as P&G’s Connect + Develop program, Campbell’s Soup Hack the Kitchen, the GE Appliances Hackathon, and the Emirates Travel Hackathon. They are all successful and cost-effective ways to drive innovation. Wouldn’t it be nice to have something like that addressing important organizational issues at your company? That’s where I think flash teams can help. The flash team concept came from researchers at Stanford University and the University of Rochester who were looking into crowd-sourced teamwork (see the original paper here). Why? Because the most complex tasks often remain incomplete because of a failure in coordination. With the flash team concept, you have one person who is wholly responsible for project completion. What gets crowdsourced are the experts who will join the team to tackle the challenge or problem. And all the communication happens online in a very socially connected kind of way. The research team even leveraged multiple flash teams to quickly create a prototype platform for online education of long-tail skills such as photographing portraits and the singing-from-the-diaphragm example. 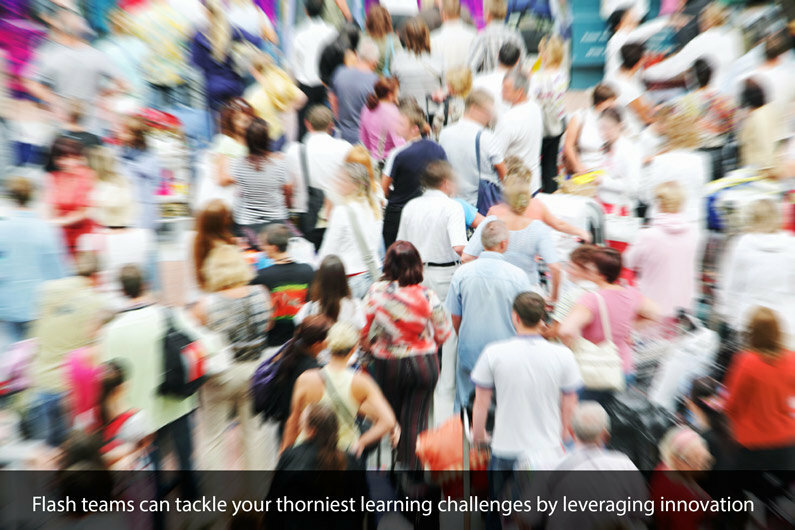 Take just a moment to envision flash teams tackling your thorniest learning challenges at your company. It’s worth noting that the participation of crowd-sourced experts is paid participation. The huge boost you get with flash teams isn’t free, but the potential savings is enormous when you think about what you get and how quickly you can get it.